Lenovo is a Chinese multinational company which designs and manufactures tablets, smart phones, personal computers, electronic storage devices, IT management software, notebooks, printers, scanners and smart televisions. It sells its products to almost 160 different countries of the world. The headquarters of this computer technology company can be found in Beijing, China as well as in North Carolina, Morrisville and United States. This company entered in the smartphone market in 2012 and in 2014, it became the largest smartphone supplier company of China. Therefore, it has introduced a variety of smart phones for its users with the latest technology and requirements. The official announcement of Lenovo A7000 smartphone was made on 2 March 2015. The launch of this smartphone in India is expected at 7 April 2015. The Lenovo A7000 smartphone contains many interesting features. Some of the important features are given below. • The operating system of Lenovo A7000 smartphone is Android 5.0, and the software of this smartphone is supported by the java. • The Lenovo A7000 smartphone contains the internal storage capacity of almost 8 GB. • Its storage can be expanded by micro SD card to about 32 GB. • The RAM is of 2 GB. • The processor of this smartphone is 1.5 GHz with fastest octa core and Mediatek Chips. • One interesting feature of this smartphone is its battery whose capacity is about 2900 mAh. • The talk time of this battery is about 39 hours while standby time is almost 11 days (264 hours). • The rear camera is 8 megapixels (MP) with dual LED flash. The other camera software features include auto focusing, face detection, and geo-tagging. • The front camera of Lenovo A7000 is 5 megapixels (MP) which is usually used for video calling and selfies. • It has 5.5 inch full HD display with a resolution of 720×1280 pixels. The quality of the screen in this smartphone is super with excellent viewing angles as well as with vibrant colors. • The display of this smartphone has the pixel density of 267 pixels per inch (PPI). • It is available in different colors which mainly include onyx black and pearl white. • It is very light in weight. Its weight is about 140 g.
• The main body of Lenovo A7000 smartphone is made up of plastic. • The sensors used in this smartphone include light sensors, accelerometer, and magnetometer and proximity sensors. 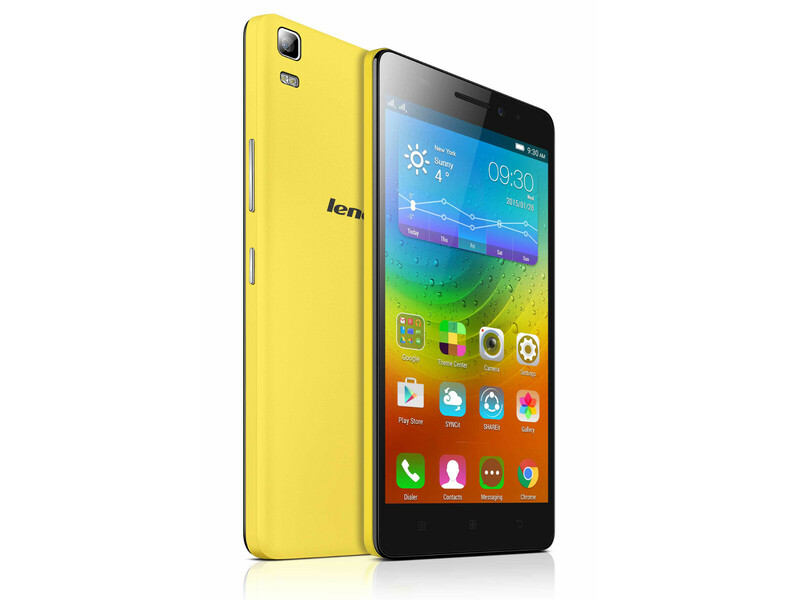 • This Lenovo A7000 smartphone contains the facility of Wi-Fi, which is around 802.11 b/g/n. • You can also use the Wi-Fi hotspot on Lenovo A7000 smartphone. • Like many other mobiles, this smartphone also contains the facility of Bluetooth having 4.0 versions. • It contains two micro SIM slots. This dual SIM facility is supported by 4GLTE, 3G, Wi-Fi, Bluetooth, and GPS. • In case of mobility and connectivity, Lenovo has designed the VIBE shot to help people to capture every moment of life. • Like other smart phones, it also contains FM radio and GPS (global positioning system). • This smartphone is designed in such a way that, one can easily use micro USB in order to transfer data. • You can also get the features of YouTube, Picasa/Google+ by using the Lenovo A7000 smartphone. • The music player of Lenovo A7000 smartphone contains the multiple features which include Album, Artist, Playlists, Album art cover, Music recognition, Preset equalizer as well as Dolby Atmos. • One of the unique features of this smartphone is its new Dolby Atmos audio technology which is superb for listening music. It also makes playback volume more consistent across all types of contents. • It also contains the options of using either an earpiece or speakers for FM radio. • The new Lenovo A7000 smartphone also provides the facilities of turn by turn navigation and even voice navigation. • The other features of this smartphone include polyphonic ringtones, vibrations, music ringtones (MP3) flight mode, silent mode, speakerphone, haptic feedback, voice dialling as well as voice recording. • The organizer of this smart phone contains a calendar, calculator, and alarm. • The messaging features of this smartphone include SMS, MMS, threaded view and predictive text input. • For instant messaging, you can use hangouts and google talk. • The phonebook of this Lenovo A7000 smartphone contains the features of multiple numbers per contact, unlimited entries, Caller groups, and search by both first and last names, Ring ID as well as Picture ID. • The price of this smartphone is affordable when compared to the other smart phones. Smartphones produced by Lenovo are nothing but great, durable, built to last and of high-quality. The company is one of the biggest and finest producers when it comes to smart technology, and this device is no exception. What is Lenovo’s next move? No one know, but one thing is for sure, the anticipating is the best part of the whole story.